If you've never been to Nashville, you may imagine the streets being lined with dark, neon-lit honky tonks that play country music all through the night. But in reality, those type of boot scootin' haunts have become a rarity. As the "It City" becomes filled with condos and upscale restaurants, there aren't as many places to throw back a beer and listen to old school country. But thankfully, there's one rather unexpected gathering place that still feels like a part of old Nashville. American Legion Post 82 sits off Gallatin Ave., the main road that leads you through the trendy and ever-gentrifying East Nashville. If you blink, you'll miss it. Slightly camouflaged by a used car dealership, the non-descript building has become one of the trendiest non-traditional venues in town. As you walk through the doors, you feel like you've traveled back in time. It's no different than any other American Legion, it's simply meant to be a place for veterans and their families to spend time together. But as you walk past the bar and into the back hall, you'll find a charming little stage that's welcomed everyone from Joshua Hedley to Kacey Musgraves. Every week, Nashvillians gather at the Legion for Honky Tonk Tuesdays, a free concert that features all country acts. The lineup changes each week, and sometimes even features surprise performances from big names. As you walk through the doors and sign your name on the mandatory guest log, you're reminded that this is no run-of-the-mill venue. A sign instructs you to keep your language in check while inside the building. A bar that seems plucked from the late 1970s is filled with regulars. In the main hall, a "Missing Man" table honoring fallen, missing and/or imprisoned military men and women sits next to a modest sized stage. And that's where all the magic happens. On first glance, you may not understand what the big deal is. But once the crowds come flowing in and the lights come down, there's an energy and camaraderie that takes over. As solo artists and bands, both local and from across the country take the stage, concertgoers do something that Nashville residents are known for never doing - dancing. Sure, two-stepping is an art down in Texas. But it's become a struggle to find somewhere to kick the dirt off your boots here in recent years. Back in the 1990s during the peak of the country line-dancing craze, the Wildhorse Saloon was the place to boot-scoot to the latest Brooks and Dunn track. These days, it's become more of a tourist stop for those beating the Broadway pavement. And that's all fine and dandy, but most country-loving locals aren't spending their weekends with the crowds downtown. The Legion offers a getaway a few miles away from Broadway, where locals can enjoy great music and dance their cares away. You don't have to pay for parking, you don't have to fight the crowds, and you're likely to spot a familiar face or two. It's also one of the few places that both the new and old generation of old school country fans hang out. 20-somethings in hip vintage shirts hang shoulder to shoulder with players from Ernest Tubb and Johnny Paycheck's bands, sporting massive belt buckles and ten-gallon hats. They are all here for the same thing. That sense of comfort and community is what draws artists to play the no-frills show each week without fail. Tanya Montana Coe, a country artist and owner of local vintage clothing store Goodbuy Girls, says the weekly gathering helps her feel connected to the roots of her hometown. "Honky Tonk Tuesdays is just a good old fashioned time, reminds of the Nashville that I grew up in," she tells Wide Open Country. "There is nothing pretentious about the legion, it's like a warm blanket to us country folk, which is why I knew I wanted to shoot my music video for 'Crazy Over Love' there." The video acts a snapshot of what a typical Tuesday night at the Legion entails, narrated by Tanya's smoky vocals. Nashville, much like country music itself, seems to be going through a slight identity crisis. As the city booms, the number of places to listen to country greats seems to dwindle. Sure, there's the Ryman and plenty of clubs and venues to see music on any given night. But many of these places are overwhelmed by tourists, which isn't necessarily a bad thing. But it leaves a space that places like Tootsie's used to fill, back before it became the place for bachelorettes to get hammered on any given Friday. Where can you go to two-step in this town? Where can you share a beer (that isn't $9 or up) with other people who love old school country music? That's why this unassuming gathering spot still draws crowds every week. 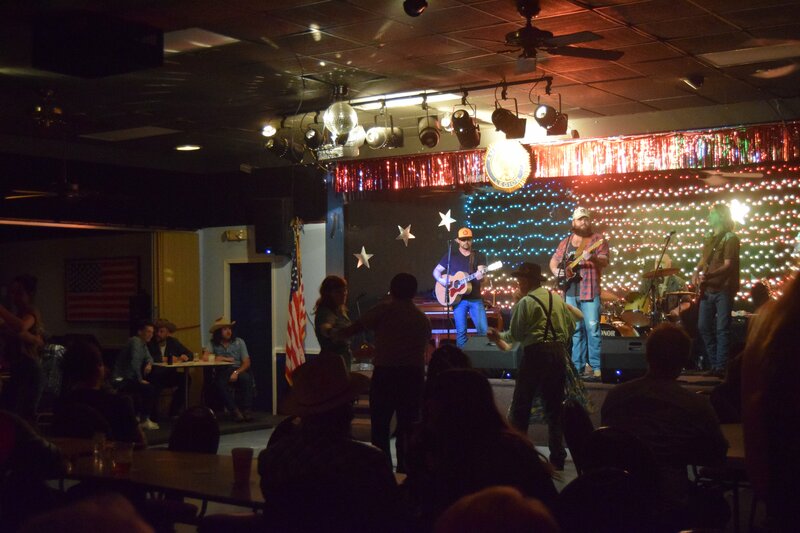 So if you ever find yourself in Nashville and want to experience what made -- and still makes -- this town really special, shine up your belt buckle, starch your Wranglers and head over to American Legion Post 82.